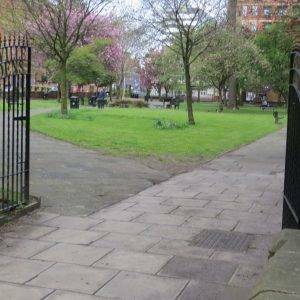 You experience more social and cultural history per square inch of a walk in Manchester than in just about any other city in the country – but because of the uncontrolled and rapid way that it grew in the 19th century, there are very few green spaces in the city centre itself. City status: Gained city status in 1853, the first new British city for 300 years. 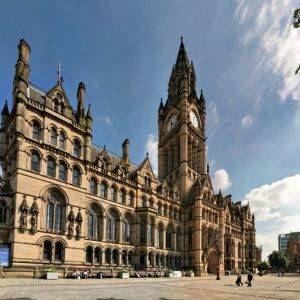 Notable city architects/planners: Alfred Waterhouse (Manchester Town Hall), Charles Barry (Manchester Art Gallery), Norman Foster (3 and 4 Hardman Square, born in the city), Urban Splash, based in Castlefield quarter. Films/TV series shot here: The Iron Lady (2011-Town Hall); Captain America (2011-Northern Quarter); Coronation St, Shameless, Queer as Folk (Gay Village), Royle Family, Cutting It (Deansgate). “For Manchester is the place where people do things… ‘Don’t talk about what you are going to do, do it.’ That is the Manchester habit. And in the past through the manifestation of this quality, the word Manchester became a synonym for energy and freedom and the right to do and to think without shackles.” Edward Parry, Judge of Manchester County Court 1894-1911. Manchester lies in a bowl-shaped land area bordered to the north and east by the Pennines, and to the south by the Cheshire Plain. 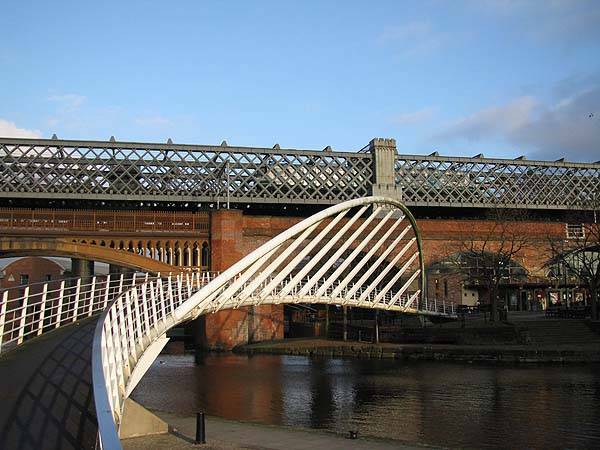 The city is consequently relatively low-lying and on the confluence of three rivers – The Irwell, The Medlock and The Mersey; the latter of which, via the Manchester Ship Canal, gives access to the sea. 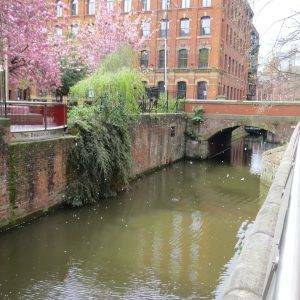 Manchester’s geographic features were highly influential in its early development as the world’s first industrial city – namely its climate, proximity to a seaport at Liverpool, the availability of water power and its nearby coal reserves. This city more than almost any other is a product of the Industrial Revolution and is widely regarded as the first modern, industrial city. 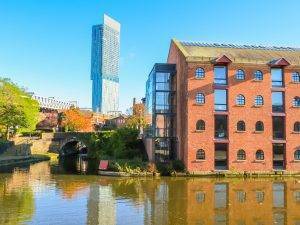 Manchester is synonymous with warehouses, railway viaducts, cotton mills and canals – remnants of a past when the city principally produced and traded goods. Manchester has minimal Georgian or medieval architecture but a vast array of 19th and 20th-century architectural styles. Cotton made Manchester, and in Asa Briggs’ words, it was the ‘shock city of the industrial revolution’ – witnessing unplanned urbanisation, a focus on money-making, extremes of wealth and squalor, an exploding population, little civic structure (the first borough council was not formed until 1838), but at the same time formative social values. It was always perceived as a ‘modern city’ and full of vitality – qualities which it exhibits just as strongly today. 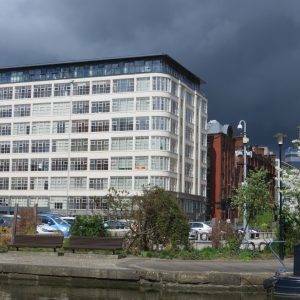 In 1781 Richard Arkwright opened the world’s first steam-driven textile mill on Miller Street in the city. Although initially inefficient, the arrival of steam power signified the beginning of the mechanisation that was to transform the burgeoning textile industries in Manchester into the world’s first centre of mass production. By 1800 Manchester was a town covered by a canopy of smoke pouring from tall chimneys. Fifty steam cotton mills dominated the skyline. They were the skyscrapers of their day. The town that people nicknamed Cottonopolis was taking shape. 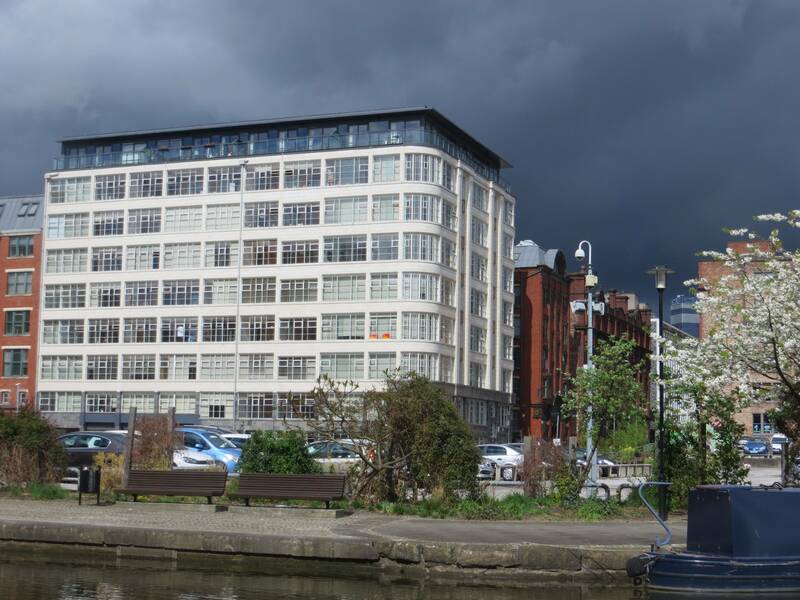 As textile manufacture switched from the home to factories, so Manchester and towns in south and east Lancashire became the largest and most productive cotton spinning centre in the world. 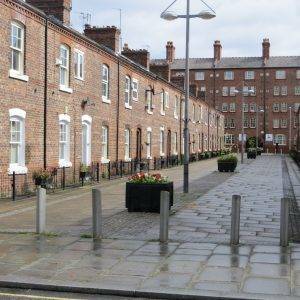 Ancoats, which we walk through, became the first industrial suburb centred on steam power. The Lancashire cotton industry peaked in 1913 when an astonishing two-thirds of the world’s cotton was processed in the area. Yet Manchester remained the hub of the world cotton goods market until the Royal Exchange closed in 1968. Some firms adapted by turning to synthetic fibres, such as polyester and fibreglass. Today, the urban landscape is still shaped by the architecture of cotton. Converted mills and warehouses have found a new lease of life as offices, hotels and flats, alongside new high-rise buildings. 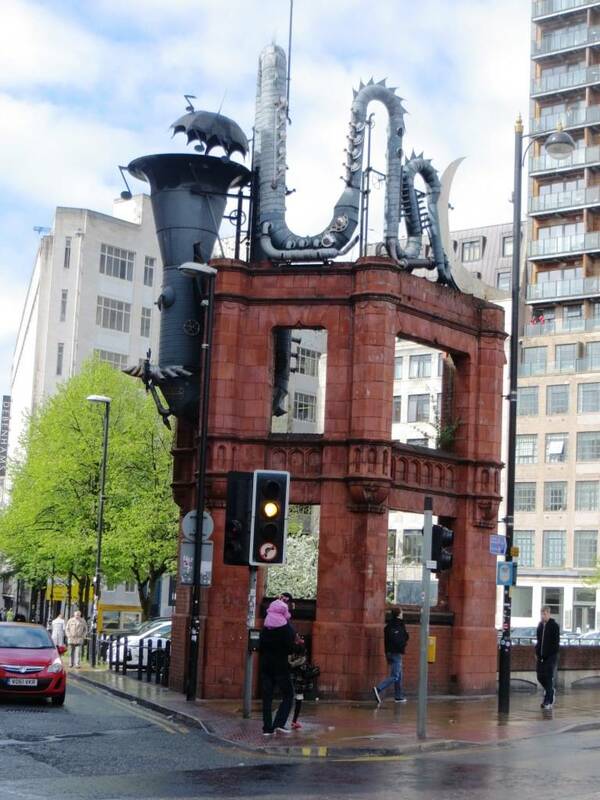 But Manchester is about much more than just its heritage as the first industrial city. A famous motto about the city is “What Manchester does today, the rest of the world does tomorrow”. And in no field is this truer than in that of social reform. Manchester was a bastion of radicalism and non-conformism in the 19th century. It was here in 1819 that the Peterloo Massacre took place amongst a large crowd campaigning for better parliamentary representation. It was here too that the Anti- Corn Law League was formed. And when the law was successfully repealed in 1846, it left the way open for a number of other radical priorities to be addressed by these progressive Mancunian thinkers – including education, financial reform and extension of the suffrage. This movement became known as the Manchester School of Liberalism. It was the city where Engels met Marx in 1845 in Manchester’s Cheetham’s Library (the UK’s first free public reference library) and started to write the Communist Manifesto. 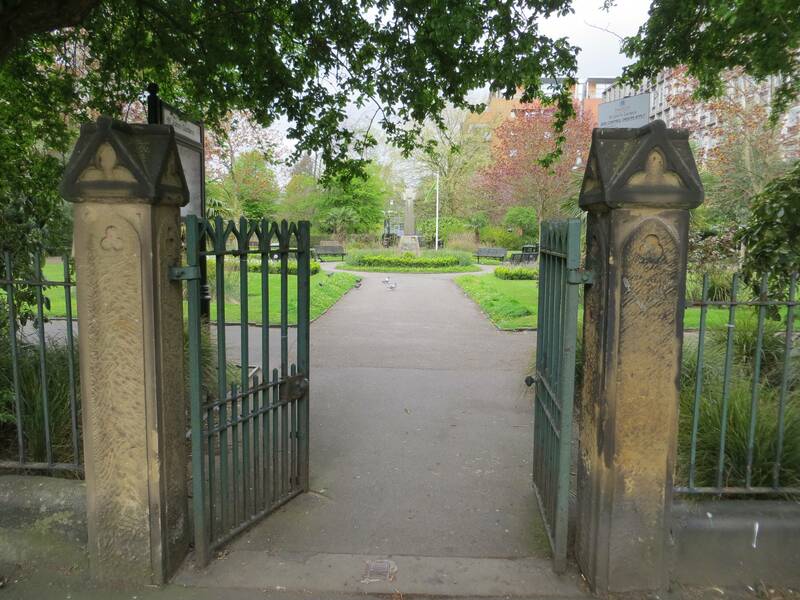 Manchester was also the first large provincial city to get public parks, although not in the city centre itself. There had been complaints just before Queen Victoria came to the throne that it was scarcely ‘in the power of the factory workmen to taste the breath of nature or to look upon its verdure’. Finally in 1846 three parks were opened in the city with great ceremony – Peel Park, Queen’s Park and Philip’s Park – but alas, because of the rapid unplanned growth that had already occurred in the city, these are some way out and cannot be incorporated in a walk that also goes through the city centre. 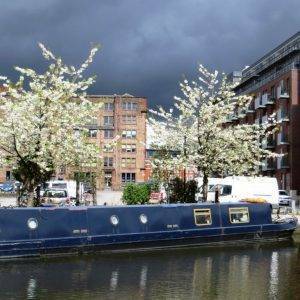 Manchester is rated as one of the UK’s most creative cities, and this walk through the city centre will make it evident why, passing by art galleries and eclectic independent shops and food outlets – but above all, you will be impressed by the buzz and creativity which fill every corner. We began at the station (Manchester Piccadilly), as any good walk should, constructed in 1842, but today feeling more like a shopping mall than a station. Nonetheless, the punters seem to like it: it has the highest customer satisfaction level of any UK station, with 92% of passengers satisfied compared with the national average of 60%. 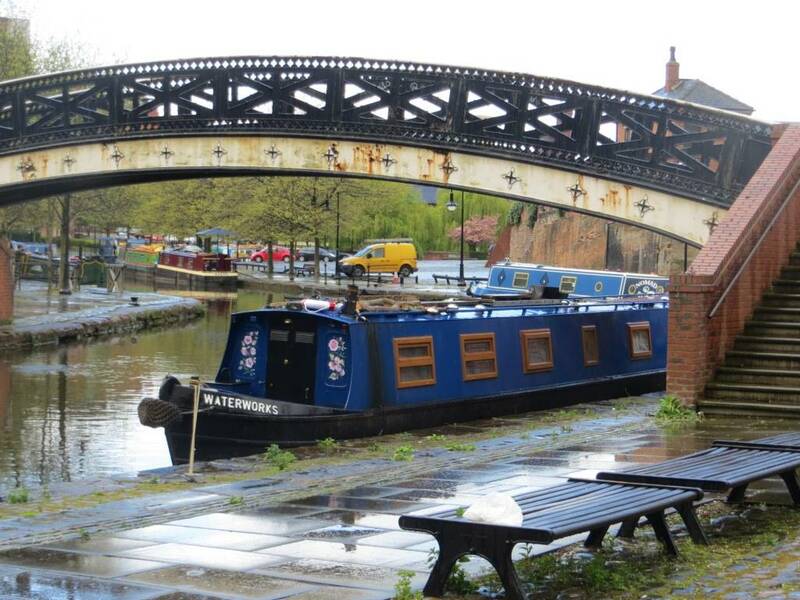 Coming out of the station along Station Approach, we walked under the Archway of the Bridgewater Basin. Dale Street Warehouse (1806), just to the left of the arch, is the only stone-built canal warehouse in Manchester, using Pennine Millstone Grit stone brought down from the moors. 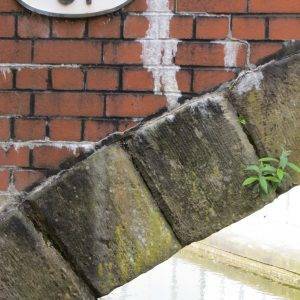 It has four shipping arches at ground level that once opened onto the water of the canal so goods could be loaded and deposited. Hidden inside is a surviving water wheel previously used to power pulleys for lifting goods between the levels. 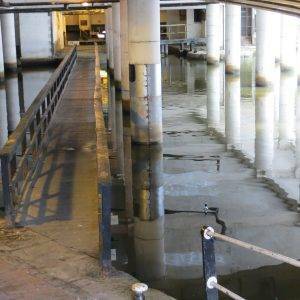 The canal arm that led to the warehouse is now in-filled and part of the car park. From here we crossed Lock 85 (Piccadilly Lock). 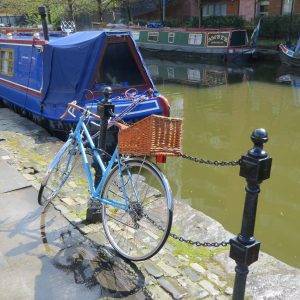 The nine locks on the Rochdale Canal through the centre of Manchester are known as the ‘Rochdale Nine’ and they follow in fairly quick succession one after the other as the canal descends towards the Bridgewater Basin. 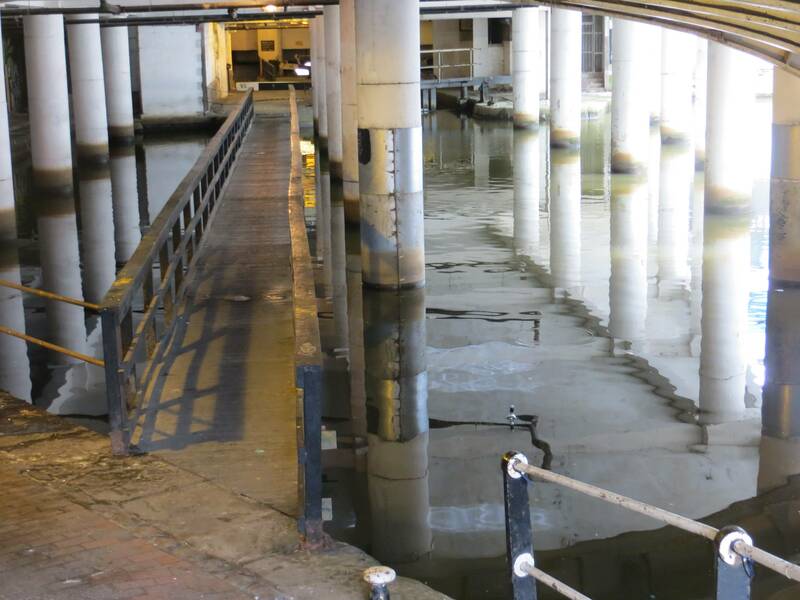 The Rochdale Canal has great charm and intrigue as it passes right through the heart of the city here, under buildings on huge concrete stilts, in a part known as the Undercroft. We felt like urban invaders stealing up unannounced on the city. But there are still quite a few people who sleep here rough as it is so out of the way, so you probably don’t want to be on your own or walking through in the dark. 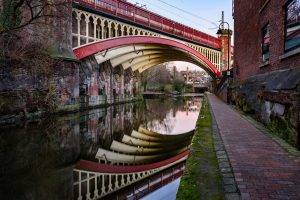 The canal opened in 1804 and runs for 51 km (32 miles) across the Pennines from the Bridgewater Canal at Castlefield Basin in Manchester to join the Calder and Hebble Navigation at Sowerby Bridge in West Yorkshire. The summit pound is 183ms (600 feet) above sea level, one of the highest in Britain. Cotton, wool, coal, limestone, timber, salt and general merchandise were transported along this route. At its zenith, the canal carried up to 50 fully laden boats per day. But its prime was short-lived, with the advent of railways from 1830 onwards; nonetheless, it limped on commercially until the middle of the twentieth century. The last complete journey took place in 1937, and by the mid-1960s the route was almost unusable. 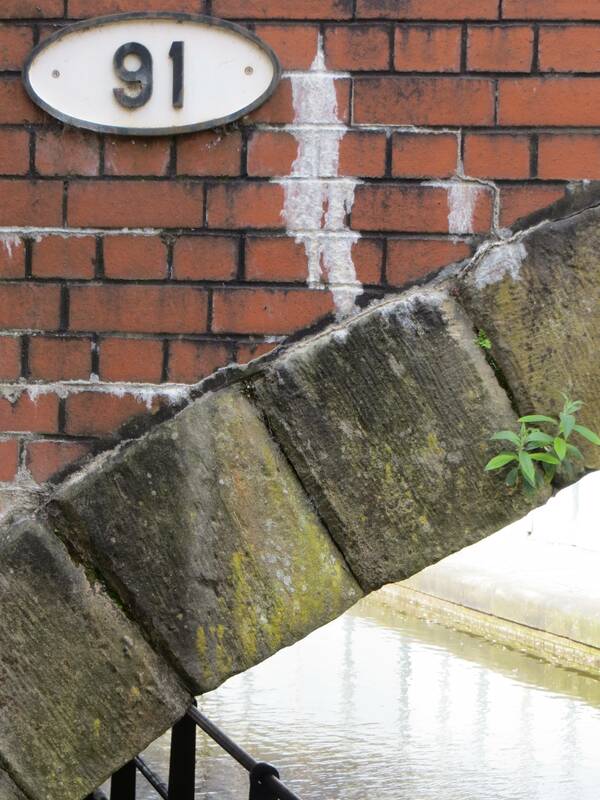 The Rochdale Canal Society, and subsequently the Waterways Trust, worked hard both to protect the line of the canal and to begin the process of refurbishing it, despite many threats including the M62 cutting it in two. 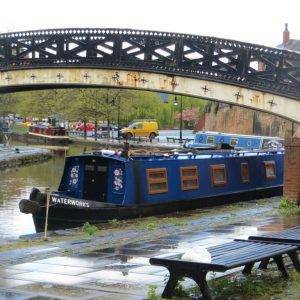 By 2002 it was fully restored and navigable again; and it has become a key focal point for many a bar and hostelry along its route, as well as being home to a thriving community of narrow boat dwellers. Coming out of the Undercroft, we soon reached Canal Street and the ‘Gay Village’ quarter of the city. With the decline of the canal, the area became a well-known ‘red light’ district and a convenient place for gay men to meet clandestinely as it was dark and unvisited. Alan Turing, who famously cracked the Enigma Code in The Second World War, was a regular visitor here in the 1950s. 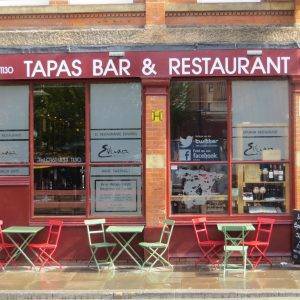 But the turning point to putting the area on the map was the opening of Manto in 1990, an openly gay bar with large plate glass windows that declared no-one was trying to hide anymore. 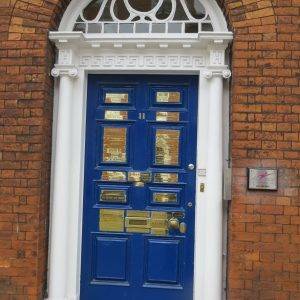 As its founder said: “I felt sick of having to knock on doors and hide”. The area reached its peak as a gay meeting place in the 1990s, but in more recent times has perhaps become over-popularised, with many TV series being filmed here, most notably Queer as Folk. It has basically got on the list of places to go for stag does or hen nights. And several of the venues have been faced with the fraught issue of whether to allow non-gays in. 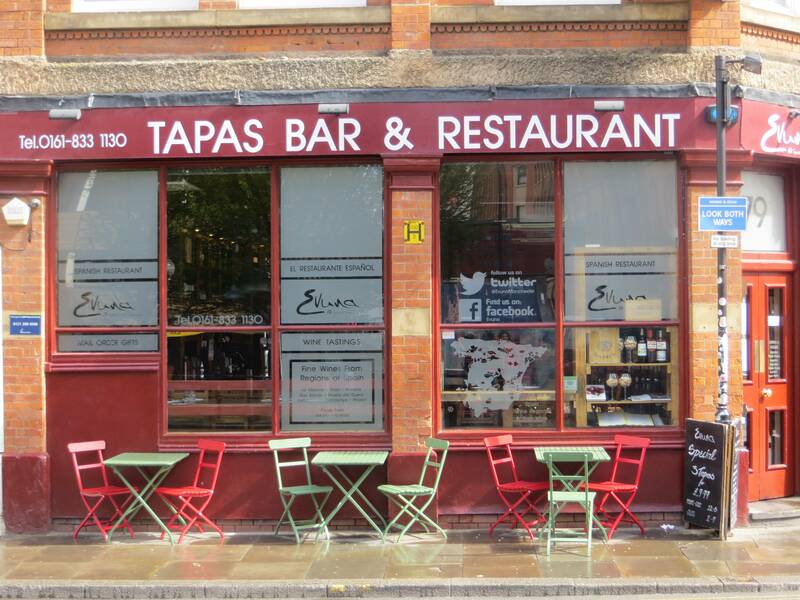 Manto closed in 2013 and for many, this was felt to be the symbolic end of the street’s edgy appeal. A quick look at Trip Advisor will show punters to be equally divided on whether this is still a cool, happening place or a busted, over-publicised flush. A fabulous example of how a single small part of a city can go through phases of use and fashion. On the south side of the canal at this point is Sackville Gardens (0.5 hectares, 1.2 acres), which has a memorial to Alan Turing, sitting on a bench. The cast bronze bench carries in relief the text ‘Alan Mathison Turing 1912-1954’ and the motto ‘Founder of Computer Science’ as it might appear if encoded by an Enigma machine: ‘IEKYF ROMSI ADXUO KVKZC GUBJ’ (mind you, shouldn’t that change every day?!) A plinth at the statue’s feet says ‘Father of computer science, mathematician, logician, wartime codebreaker, victim of prejudice’. 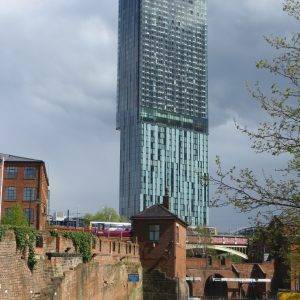 As we moved on down the canal, so a big new building comes into focus – Deansgate’s Beetham Tower – symbol of Manchester’s regeneration and renewed wealth. 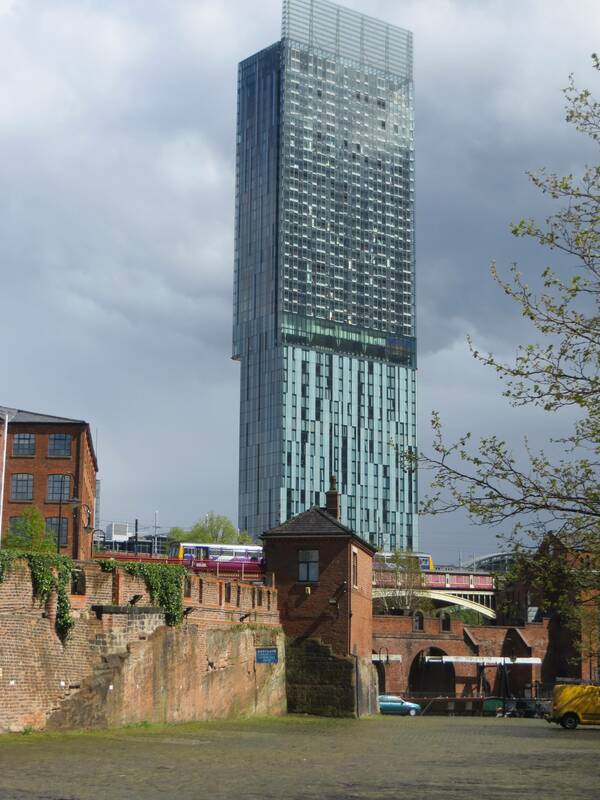 Beetham Tower (2006) (also known as the Hilton Tower) is a landmark 47-storey mixed-use skyscraper. 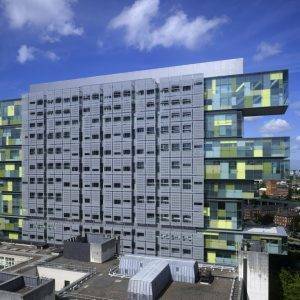 It is named after its developers, the Beetham Organisation, and was designed by Ian Simpson. It has been described by the Financial Times as “the UK’s only proper skyscraper outside London”. In a short space of time, it has become an iconic building, featured in the opening titles of several television programmes, including Coronation Street. 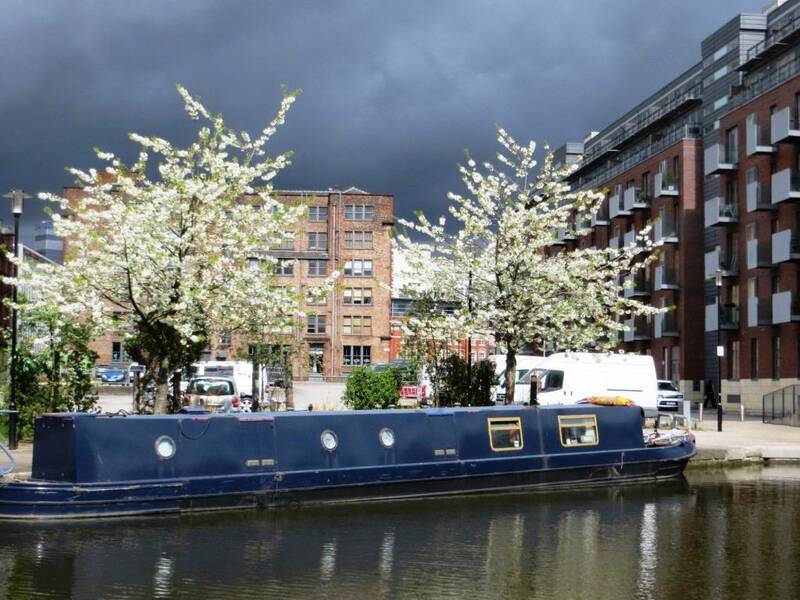 After Deansgate, we soon reached Castlefield. 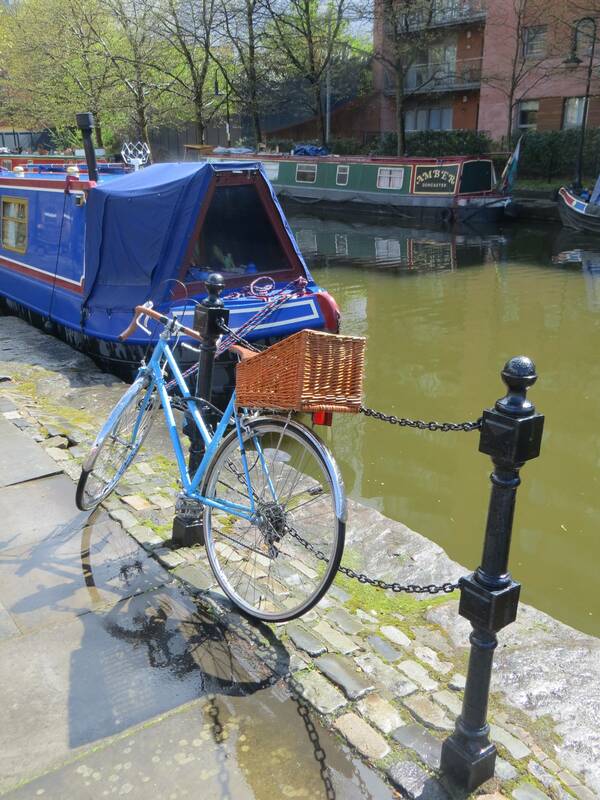 It has been said that the arrival of the Bridgewater Canal here in 1761, linking the Duke of Bridgewater’s mines at Worsley to the centre of the city, marked the start of the Industrial Revolution (that’s what they taught me in Economic History at school at least!). It halved the price of coal, making steam power commercially viable. 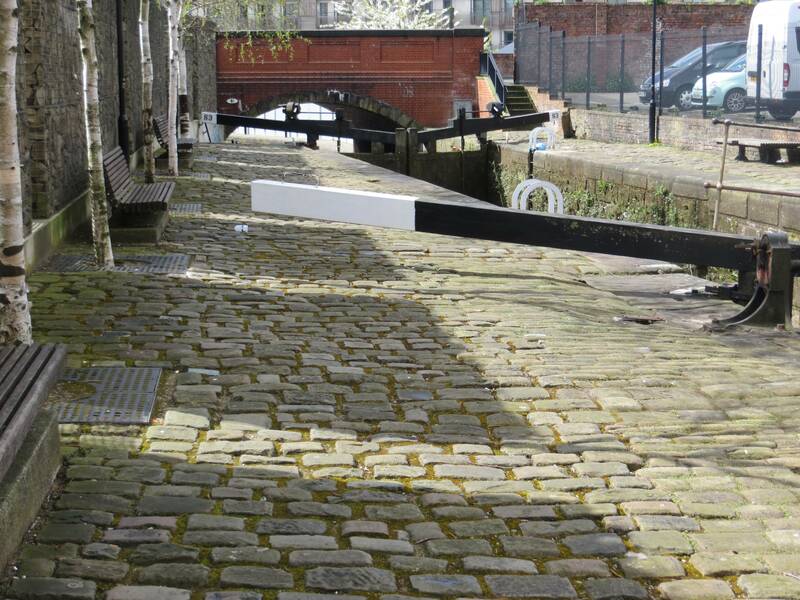 As well as coal, the canal transported foodstuffs, cotton, salt, timber and stone. 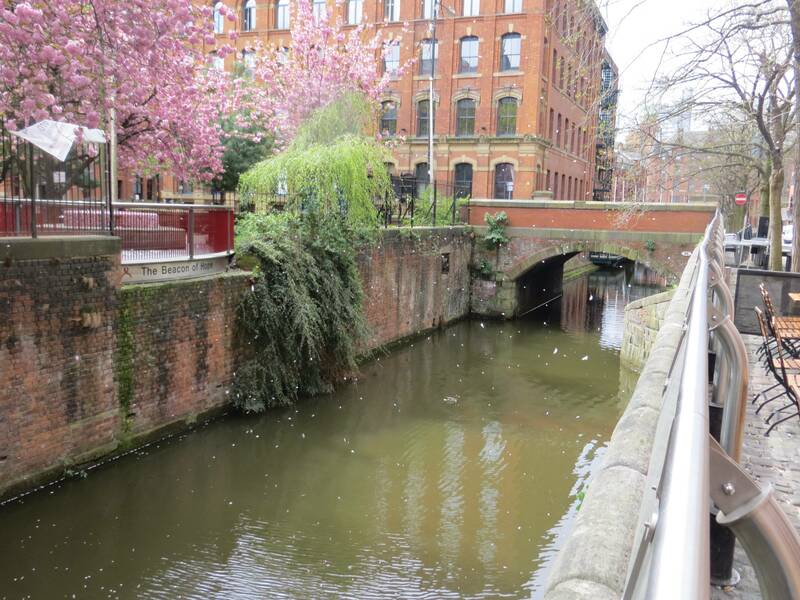 Castlefield was designated as a conservation area in 1980 and the United Kingdom’s first designated Urban Heritage Park in 1982, and it has benefited from much sensitive restoration. The Merchants’ Warehouse (1827) was constructed on the north bank at the entrance to the Giant’s Basin. This was a four-storey warehouse with two shipping holes. On the street side, it had six side loading bays. 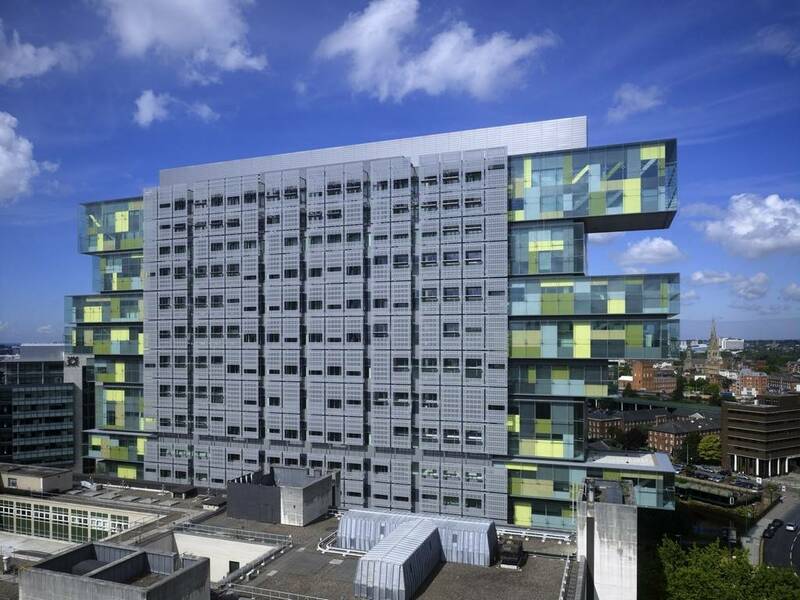 As a symbol of the transformation of Manchester from an industrial-based to a knowledge-based economy, this building serves very well: it is now home to communication, professional services and software businesses. We followed the basin round to the gleaming white sickle-shaped bridge that leaps energetically across the main canal basin opposite Barca Bar. 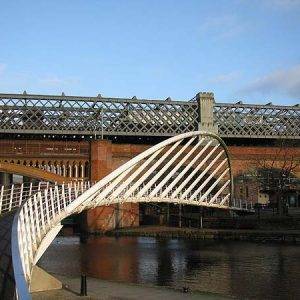 It is called the Merchant’s Bridge (1995) and was designed by Whitby and Bird. Up next was the Museum of Science and Industry. The Museum uses its collections to tell the story of Manchester as the world’s first industrial city. Their mission statement is suitably ambitious… “To explore where science met industry and the modern world began, and to understand the impact that Manchester science, technology and innovation continues to have on all our lives” ….but when you consider that one of the buildings is the world’s first railway station, – Manchester Liverpool Road, which opened as part of the Liverpool and Manchester Railway in September 1830 – then you can start to see it’s a reasonable mission, which in fact they fully accomplish – try to build some spare time into your day to spend a couple of hours here.For me, the railway station was the most fascinating bit – especially discovering that the railway was so keen to attract genteel travellers that it even offered flat trucks on which private coaches could be loaded, occupants, horses and all. 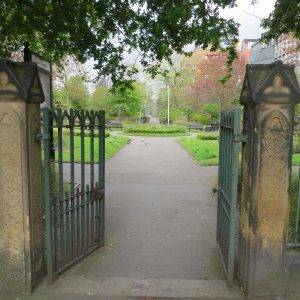 I loved the little park we went into next – St John’s Gardens (0.6 hectares, 1.5 acres) – which is the only truly green space in the city centre. And even that’s really more by mishap than planning, as this was formerly the site of St John’s Church, commissioned by John Byrom in 1769 and demolished in 1931 after a long period of neglect. 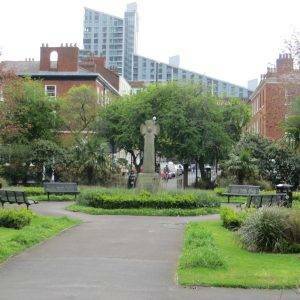 Today a stone cross stands in the gardens to commemorate the church. 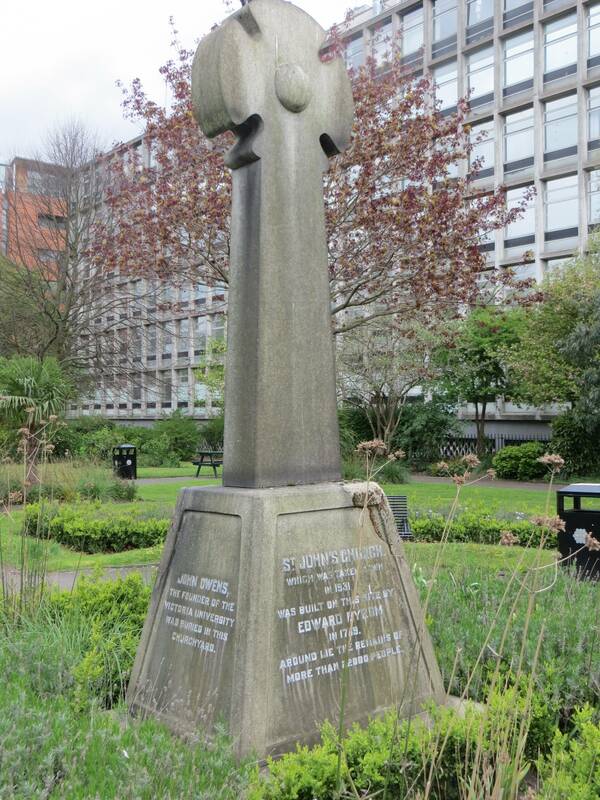 The plaque at the base of the cross says (rather incredibly) that the remains of 22,000 lie buried in this graveyard. Among them is John Owens, founder of Owens’ College which became Manchester University. 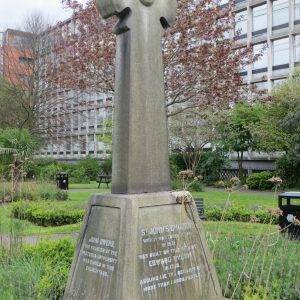 Also buried here is William Marsden who was famous for introducing the concept of a half-day holiday on Saturdays. The idea that workers would stop work at noon on Saturdays must have been revolutionary in its day and probably welcomed by the workers. We decided to take a break at this point too, it being a Saturday, and sat on a bench and watched the world go by. The gateway we passed through as we eventually exited the gardens is the original gate to the church. Opposite you will see St John St, in which the majority of the houses are listed – it is the only Georgian part of the city that still survives – occupied now by solicitors, accountants and medics seeking status – including one door on which we counted more than 30 professional brass name plaques. 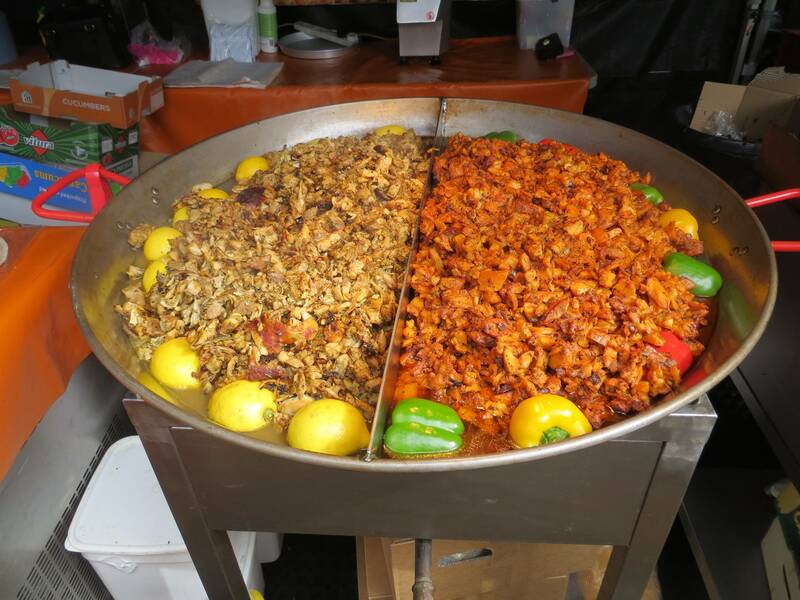 But having admired it, we turned back on ourselves and headed up Byrom St towards one of the newest, most modern parts of the city, Spinningfields, which was re-developed in the 2000s as a business, retail and residential development. But just before getting there, we passed the Cobden House (1770s) on our left. This was originally the home of Richard Cobden, prominent entrepreneur, politician and member of the Anti-Corn Law League. It was bought by John Owens in 1851 to fund the establishment of Owens College, which was on this site until 1873 when it moved to a new home on Oxford Road (now the University of Manchester). The building then became a County Court until 1990. 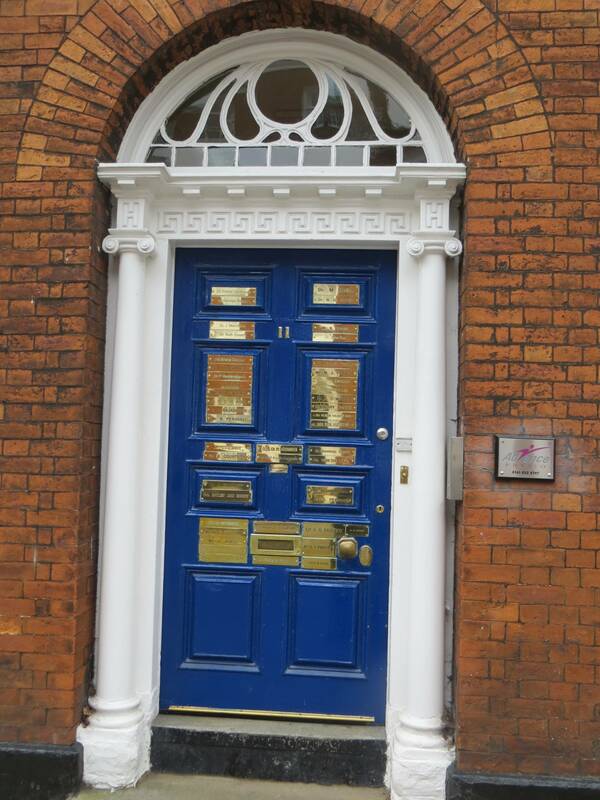 Today Cobden House is a barristers’ chambers and it has been completely refurbished to its Georgian splendour. We strolled slowly through the open space of Hardman Square (0.5 hectares, 1.2 acres), looking up at some interesting modern buildings around it. 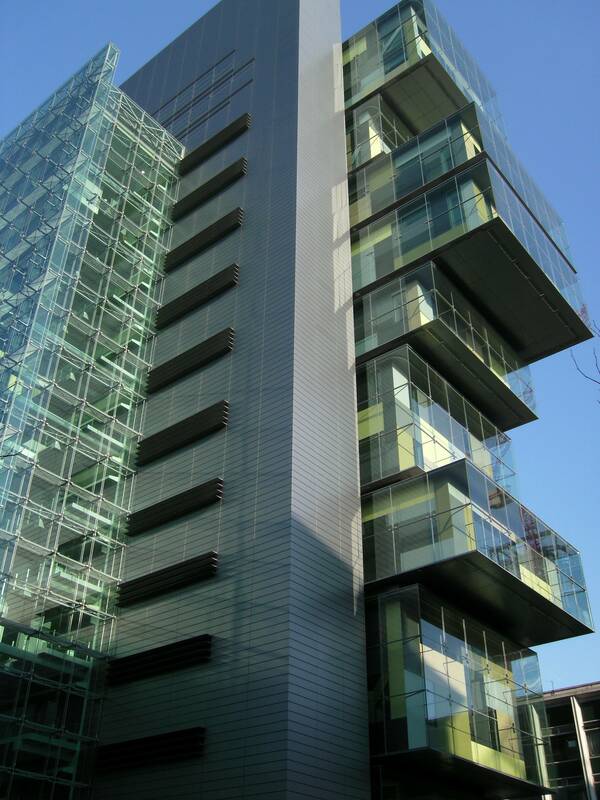 No 1 displays a unique external design with checkerboard cladding and windows, resulting in a striking appearance. To its right are two Norman Foster buildings, No 3 and No, 4. Norman Foster grew up in Manchester and worked in the Manchester Town Hall as a junior clerk. 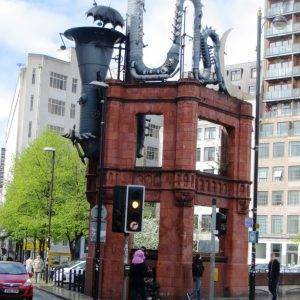 He often talks about the richness of Manchester’s industrial and Victorian landscape inspiring his overall architectural style – in which function, as well as form, is celebrated. Bearing north from the square, our eyes alighted upon one of Manchester’s finest modern buildings, the Manchester Civil Justice Centre (2007). It was nominated for RIBA’s Stirling Prize and named one of the “Best British buildings of the 21st century” by Blueprint magazine. The John Rylands Library (1900) is one of Manchester’s great late-Victorian neo-Gothic buildings, with Arts & Crafts touches. 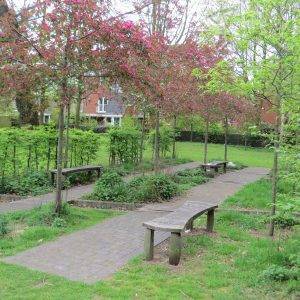 It was designed by Basil Champneys, best known for his work designing Oxbridge colleges. Inside, it feels like a cathedral filled with books, and houses one of the world’s finest collections of rare books and manuscripts, including a first edition of Chaucer’s Canterbury Tales. 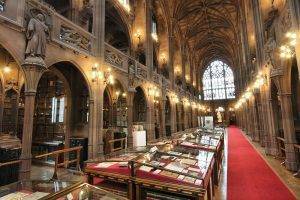 John Ryland was one of the wealthiest and most successful Manchester cotton barons of his era, the epitome of a self-made Mancunian, and the library was bequeathed by his wife Enriqueta in his memory and to foster learning. Brazennoze Street runs between Albert Square and Deansgate and for much of its length is a pedestrianised walkway. Along the way, the street opens out into Lincoln Square, named after the monument that was erected there in 1986. 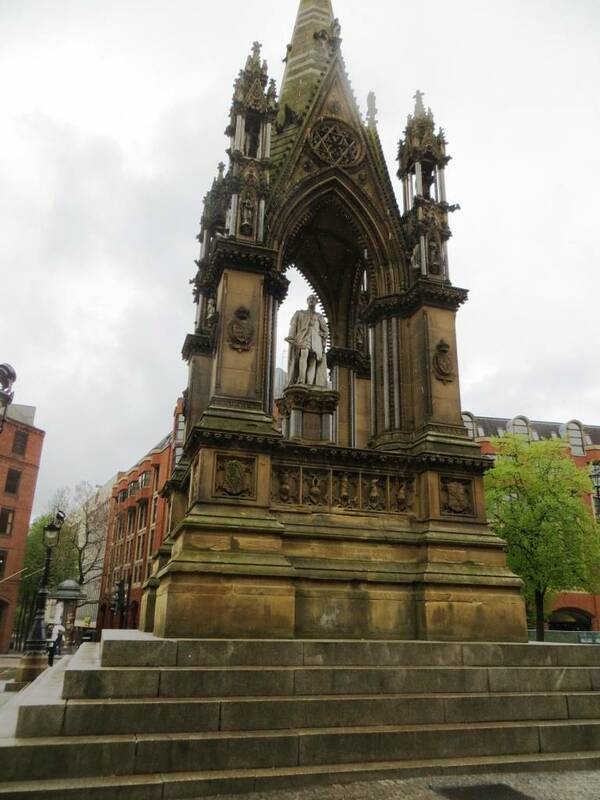 Why is Abraham Lincoln standing on a plinth in the middle of Manchester? Well, in 1862, Lancashire cotton mill workers, at considerable personal sacrifice, took a stand by refusing to touch raw cotton picked by US slaves, thus helping Lincoln defeat the Southern Confederacy and restoring the union. With the Lancashire cotton industry on its knees, Lincoln acknowledged the self-sacrifice of the ‘working men of Manchester’ in a letter he sent them in 1863. Lincoln’s words – inscribed on the pedestal of this statue – praised the workers for their selfless act of “sublime Christian heroism, which has not been surpassed in any age or in any country”. 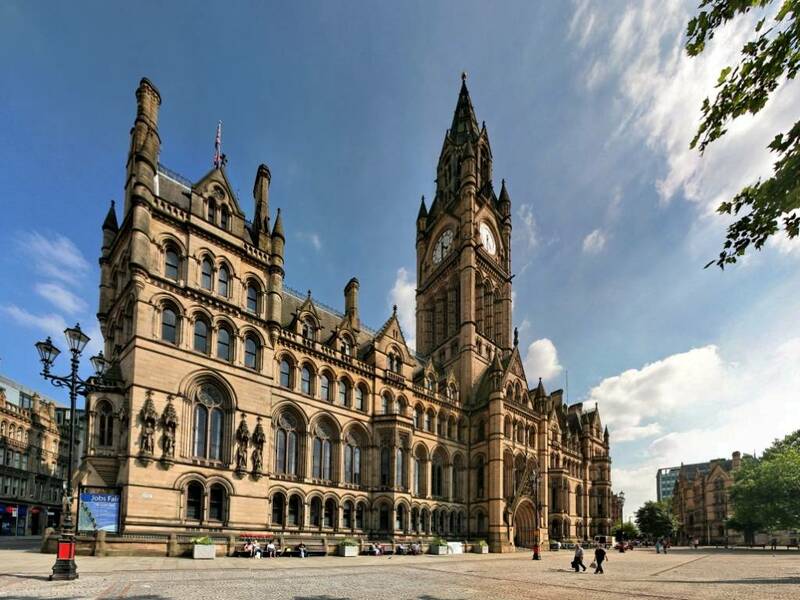 And then we arrived with a visual roll of the drums into classic Victorian and Edwardian Manchester: passing in quick succession the Albert Monument, The Town Hall, the Central Library, The Free Trade Hall, the Midland Hotel, St Peter’s Square, the cenotaph and the Manchester Art Gallery. Victoria-philes, revel in it! 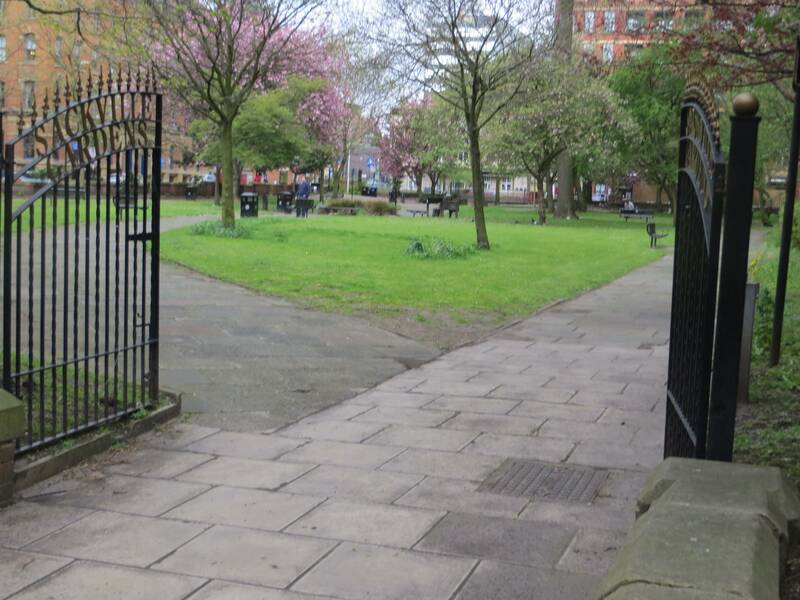 The area in which Albert Square is now situated was once an area of dense slum housing. Clearing the site began in 1864, and required the demolition of over 100 buildings. 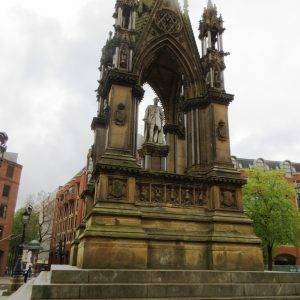 The project was encouraged by the visit of the Prince and Princess of Wales to open the Albert Monument in 1869. It was decided to construct a new Town Hall (1877), as the old building in King Street had become too small. Following an architectural competition, Gothic designs for a building with a high bell tower by Sir Alfred Waterhouse, particularly associated with the Victorian Gothic revival movement, were selected. Today it is regarded as one of the finest examples of Gothic revival architecture in the world. Inside you will discover Ford Madox Brown’s impressive Manchester Murals illustrating the history of the city. Facing St Peter’s Square, the Manchester Central Library (1934) was designed by Vincent Harris (also, Council House Bristol and Leeds Civic Hall). The form of the building, a columned portico attached to a rotunda domed structure, is loosely derived from the Pantheon in Rome. Manchester had been the first local authority in the country to provide a public lending and reference library after the passing of the Public Libraries Act 1850. The Manchester Free Library had been opened at Campfield in 1852 at a ceremony attended by Charles Dickens. 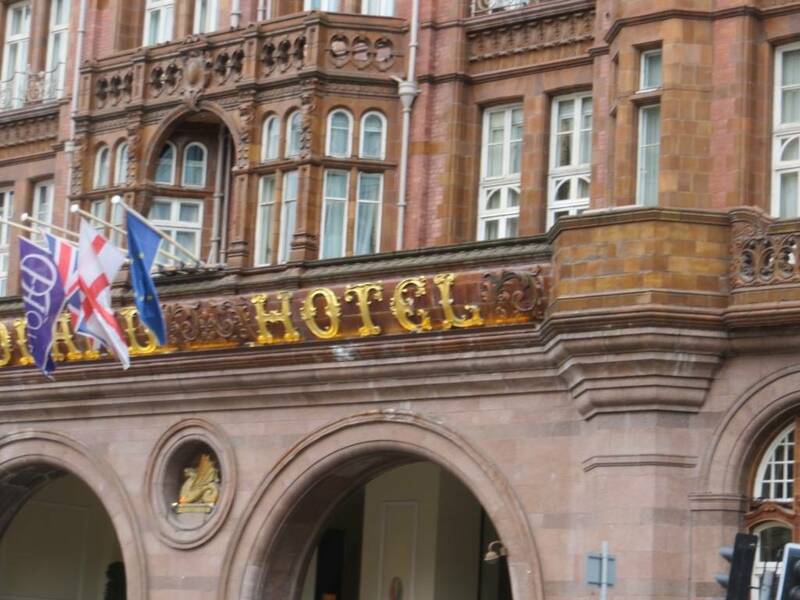 Alongside the library is the grand Midland Hotel (1903), built by the Midland Railway to serve the Manchester Central railway station, the northern terminus for its rail services to London St Pancras. It faces onto St Peter’s Square. 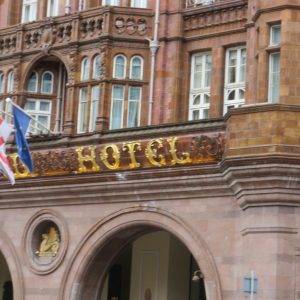 The hotel was designed by Charles Trubshaw in a highly individualistic Edwardian Baroque style. The hotel was apparently coveted by Adolf Hitler, who had a keen interest in architecture, as a possible Nazi headquarters in Britain. American intelligence speculated that the area of Manchester around the Town Hall was spared from bombing so as not to damage or destroy the Midland Hotel. The Free Trade Hall (1856) (now the Radisson Blu Hotel) in Peter St (just off the route, to your right) was built as a public hall between 1853 and 1856 by Edward Walters. Two earlier halls had been constructed on the site, the first, a large timber pavilion was built in 1840, and its brick replacement built in 1842. The halls were an important meeting place in the long campaign for the repeal of the Corn Laws. The new hall was funded by public subscription and became a concert hall and home of the Hallé Orchestra in 1858. It also continued to be an important venue for public events and political speeches. In 1872 Benjamin Disraeli gave his One Nation speech here. In 1904, Winston Churchill delivered a speech defending Britain’s policy of free trade. In 1905 the Women’s Social and Political Union (WSPU) activists, Christabel Pankhurst and Annie Kenney, were ejected from a meeting addressed by the Liberal politician Sir Edward Grey, who repeatedly refused to answer their question on Votes for Women. Christabel Pankhurst immediately began an impromptu meeting outside, and when the police moved them on, was arrested and brought to court. So began the WSPU campaign for the vote. St Peter’s Square was the scene of the 1819 Peterloo Massacre when cavalry charged into a crowd of nearly 80,000 that had gathered to demand the reform of parliamentary representation. 15 people were killed and many hundreds injured. The day we walked through it was also the site of the Metrolink Massacre, blocked off by tram construction (now completed). Whilst the trams provide a vital service to the city, the street furniture and concrete ‘mounting blocks’ are a very intrusive blot on Manchester’s very limited open spaces (the same problem occurs at Piccadilly Gardens). In many ways, the square is being sacrificed as a tram interchange. Manchester could learn a thing or two from Continental cities as to how to make trams less intrusive. On the far side of the square, walking alongside the tram route with its huge poles and many signs, we passed by the Manchester Art Gallery (1824), built by Charles Barry (of Houses of Parliament fame) in the Greek neo-classical style. The gallery has a good collection of Victorian art, especially the Pre-Raphaelites, and Victorian decorative arts. 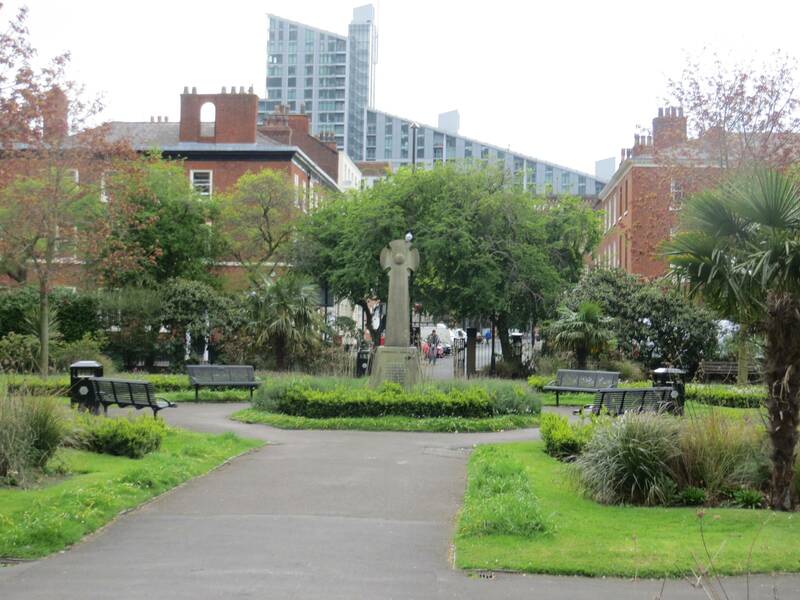 Piccadilly Gardens (0.8 hectares, 1.9 acres), in many people’s eyes the ‘heart of the city’, started life, like almost all the open space in the city centre, as reclaimed land, previously housing the city’s infirmary and the library’s reference department. 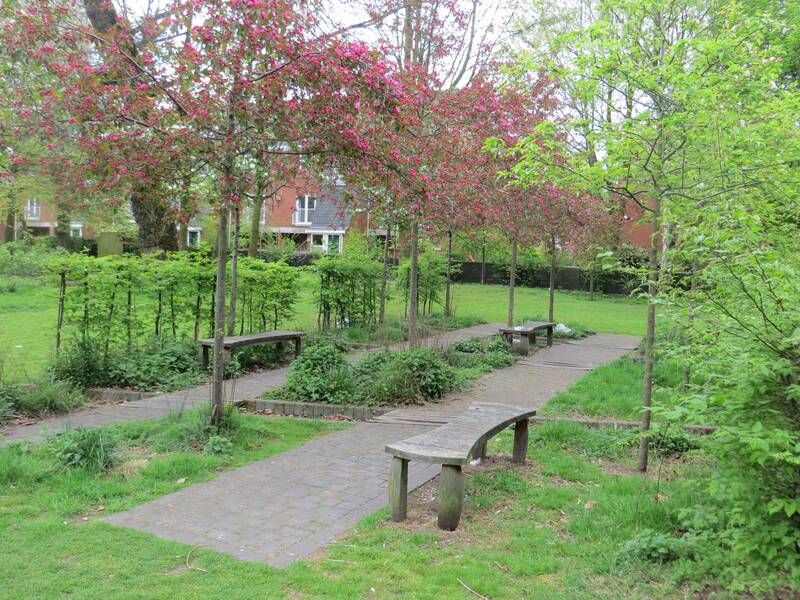 It ended up being the largest green space in the city centre, initially looking very much like a traditional city park with flower borders and wooden benches. In 2002, however, it was reconfigured with a water feature and concrete pavilion by Japanese architect Tadao Ando. 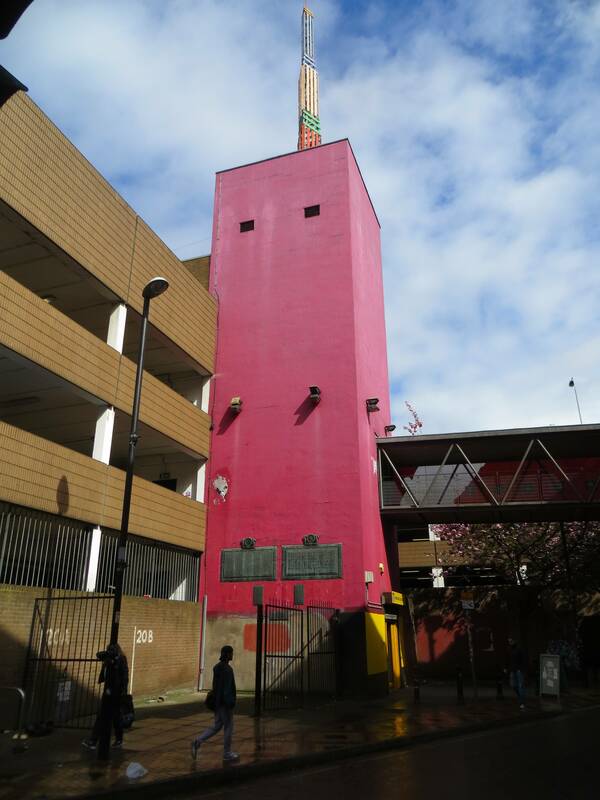 The pavilion wall is soon to be removed – people never warmed to it, giving it the nickname Manchester’s Berlin Wall; and whilst the space works admirably as a place of congregation, market stalls and as a transport hub, it lacks traditional flower borders and sense of repose. It’s not where you’d go at lunchtime to relax with a sandwich and novel, it’s more a space for congregation and movement. Maybe you’ll just have to head back to St John’s Gardens if you want that. Incredible as it might seem walking through it today, in the 1840s the Northern Quarter was at the epicentre of one of the most significant economic changes in history, with the Industrial Revolution at full throttle and Manchester taking its place as the world capital of the textile industry. 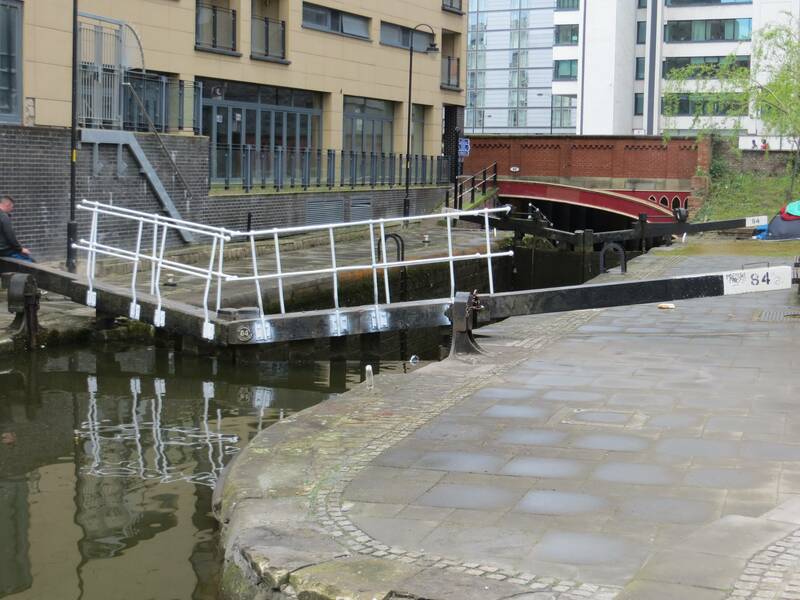 It was the spot where Manchester’s first cotton mill was opened by Richard Arkwright in 1783. By 1816, there were 86 mills in the central area of Manchester, and by 1853 there were 108. In those days, of course, there was no concept of zoning, which was one of the key factors in the squalid living conditions that arose in that period. The area around Withy Grove and Shudehill is described by Engels in The Condition of the Working Class in England as unsanitary and down at heel: “dirty old and tumble-down, and the construction of the side-streets utterly horrible”. Engels also talks of “pigs walking about in the alleys, rooting in offal heaps”. The ‘Northern Quarter’ tag as such did not exist until the mid-1990s when a number of interested parties got together and defined a boundary, came up with the name and branded the area as such. 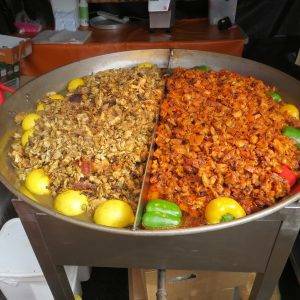 Today it is a Mecca for independent, quirky shops, bars, andcafés … and a magnet for alternative and bohemian culture. It is renowned for its creative industries, and in particular fashion design, with various designers, agencies, and clothing wholesalers populating its back streets. There are also a number of commercial art galleries in the area. We took a look round The Richard Goodall Gallery and then the Manchester Craft & Design Centre. The Gallery is one of the UK’s largest commercial galleries, specialising in contemporary art, fine art photography and rock posters. Further along Oak Street, we discovered the Manchester Craft and Design Centre, formerly a Victorian Fish and Poultry Market. 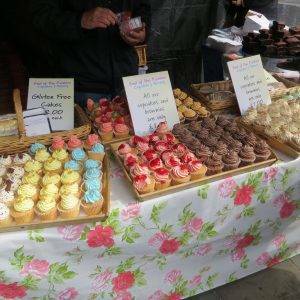 Eighteen studio boutiques take the place of fish stalls and artists and designers produce and sell their wares to the public. There is an assortment of different crafts and art, from jewellery and accessories to clothing, furniture, lighting, textiles, ceramics, photography and painting. Coming out of the Northern Quarter and crossing the busy Great Ancoats Street into Oldham Rd, we marvelled at the Daily Express Building (1939), designed by engineer Sir Owen Williams across the road on our right, prominent in its art deco style, now converted into offices. The building is futurist art deco, with its horizontal lines and curved corners, clad in a combination of opaque and vitrolite glass. 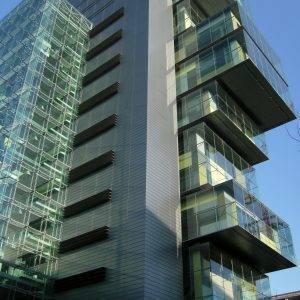 It was considered highly radical at the time and incorporated curtain walling, an emerging technology. When we first saw it, it looked so modern we thought it had been built in the last decade and probably designed by Norman Foster. In fact, Foster had admired it very much in his youth and now lists it as one of his top five favourite buildings in the world. Foster’s first really notable work, the Willis Faber and Dumas Headquarters (1975) in Ipswich (see our Ipswich urban ramble), shares several features with this building, such as the use of dark glass, curtain walling and few right-angled corners. It’s also a reminder of the glory days of newspapers when the print works were in the bowels of the building and the arcane language of hot letterpress ruled the day – hot metal, off-stone times etc. The Daily Express building had transported us back to the early twentieth century and, as we headed up the Oldham Rd and then right down into Cornell St we entered the Ancoats quarter and the nineteenth century. 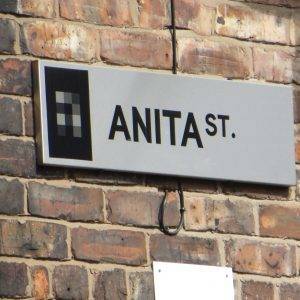 On our left we soon spotted an oddly named street, Anita St. The name just seemed out of place with the other street names somehow, we wondered what its origin could have been? The street comprises two rows of two-storey tenement terraces. Perhaps it was the puzzlement on my face, perhaps the fact that I was taking pictures, perhaps just his innate garrulousness, but a man in his fifties walking along the street came up to us and proceeded to tell us the history of the street and area. 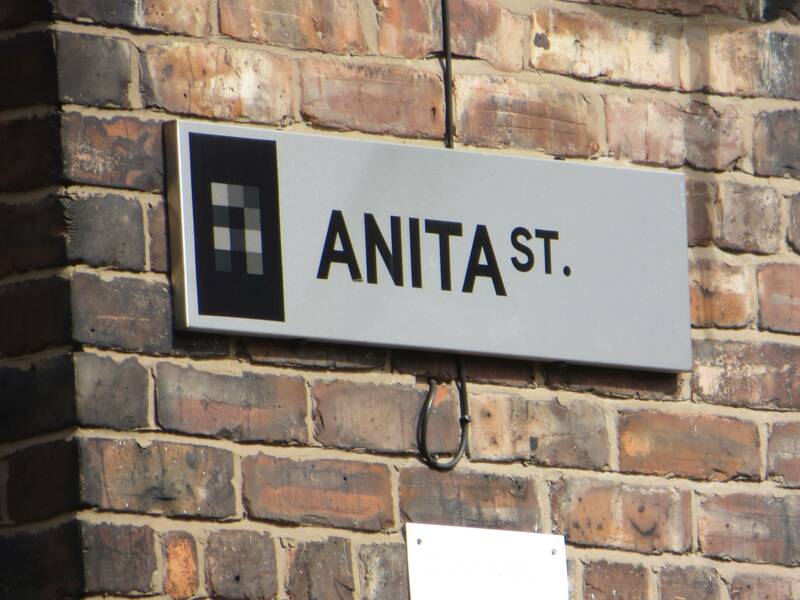 Anita St, it turns out, was originally called Sanitary St, part of a project by the Sanitary Committee of the Corporation in the 1890s to improve the quality of housing and hygiene. The ‘S’ and ‘ry’ were discretely dumped in the 1960s when ‘Sanitary’ became less a badge of honour and more a taint of municipalism. Toni, who had by now become our friendly guide, turned out to be of Italian descent; he described to us how, when he had been born here in the early 1950s, the area was still known as ‘Little Italy’ and full of Italian families, many of whom were in the ice cream trade, which they then dominated in the city. At its peak, the population of Italians in ‘Little Italy’ was over 2,000. Italians had begun moving to Manchester in the early 19th century because of poverty and the instability caused by the unification of their home country. Chain migration meant that whole families and even entire villages from particular Italian regions often regrouped in Ancoats. This regrouping was encouraged by the Italian system of ‘padronismo’, whereby a padrone (almost an agent) used his connections in Italy to recruit workers, bearing the responsibility for their work and lodgings when they arrived. 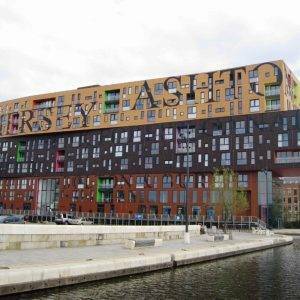 Most of Ancoats’ Italians originated from Liguria in northern Italy and Caserta, south-east of Rome. After the Second World War, Manchester had its own Ice Cream Wars, with firms involved in intense competition that descended into vendettas. But ultimately, however, it was the slum clearance in the 1960s which dispersed the Italian community for good. There were two Catholic Schools within the area. Toni went to St. Alban’s, which was situated in Fawcett Street close to the steep bridge over the Rochdale Canal, (wistfully known by the Italian people as the “Ponte Vecchio”) and St Michael’s, which was situated in George Leigh street. He was taught Italian as well as English. 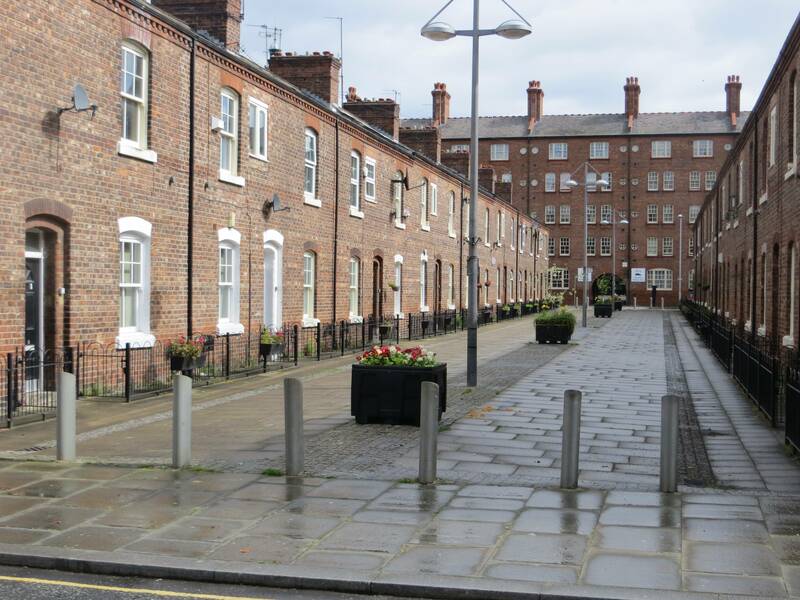 Toni strolled with us through the main area of Ancoats, where at the height of the industrial revolution there had been the biggest concentration of mills anywhere in Manchester and probably in Europe. Royal Mill (1912), located on the corner of Redhill Street and Henry Street, was constructed on part of the site of the earlier McConnel & Kennedy mills, established in 1798. It was originally called New Old Mill and was renamed following a royal visit by King George VI and Queen Elizabeth in 1942. A plaque commemorates the occasion. This is one of many restored mills that collectively comprise the best and most-complete surviving examples of early large-scale factories concentrated in one area. We waved goodbye to Toni on the ‘Ponte Vecchio’ bridge and then headed east on the southern side of the Rochdale Canal. The New Islington Marina shortly on your right, now filling up with boats, includes a new public park called Cotton Field. The park is open to the public during the day, but closed and locked at night. 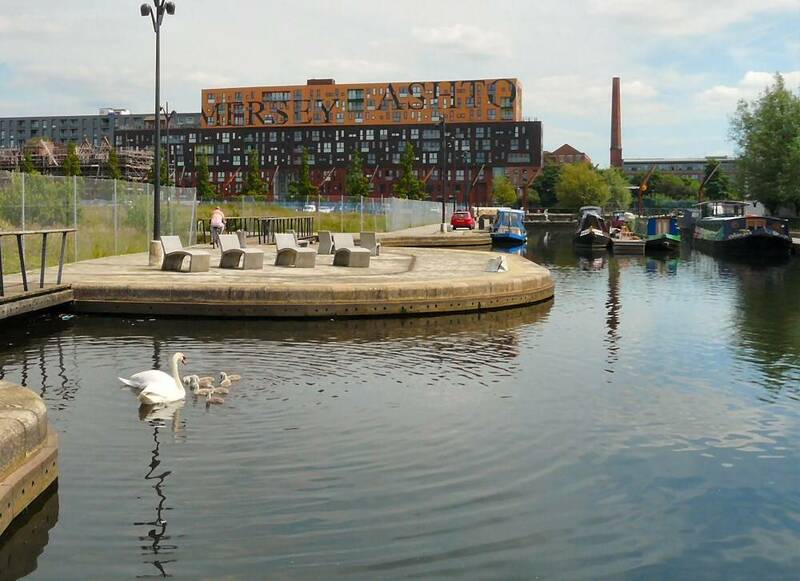 This new eco-park forms the heart of New Islington, using nature to bring people together within an urban environment. It consists of a new body of water, a boardwalk, an ‘urban beach’ and distinctive islands. Extensive planting includes an orchard island, a protective grove of Scots Pines around the beach, and wildflowers and reed beds. 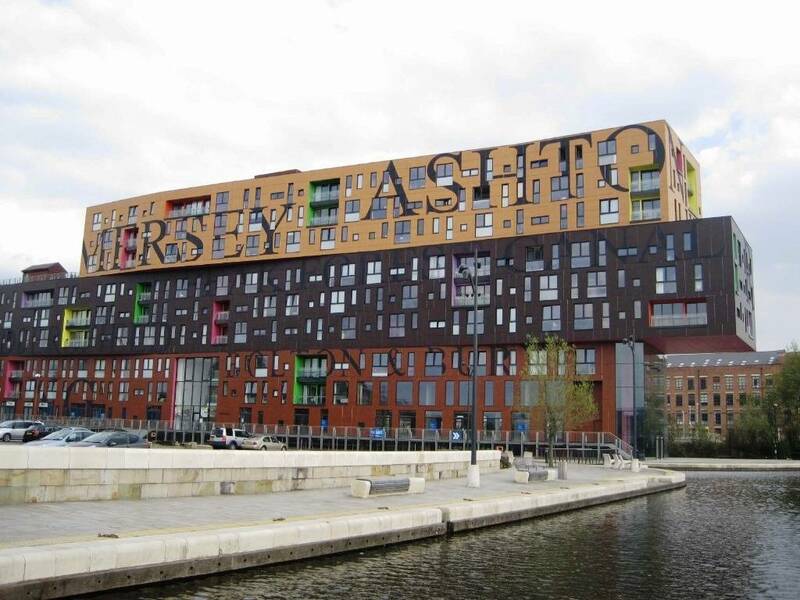 Just to the south of here is the New Islington Project, developed by Urban Splash, which includes the famous ‘Chips’ (2009) development at Lock 2 of the Ashton Canal. 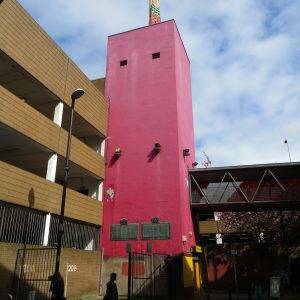 Will Alsop, the architect, offered the following honest assessment of his inspiration: “My inspiration was chips! Three fat ones to be precise, stacked on top of each other.” This building is pure fun and is not intended to promote obesity. 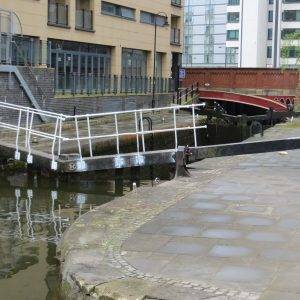 On our way back along the canal, we crossed the Store St Aqueduct (1798) , built by Benjamin Outram on a skew of 45° across Store Street, and believed to be the first major aqueduct of its kind in Great Britain and the oldest still in use today. 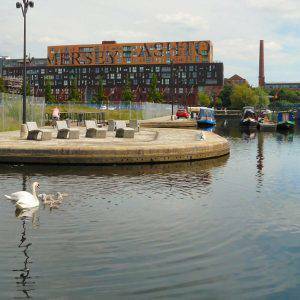 Our walk finished up along the north side of the Ashton Canal and soon re-joined the Rochdale Canal at Piccadilly Basin and the start of the walk. 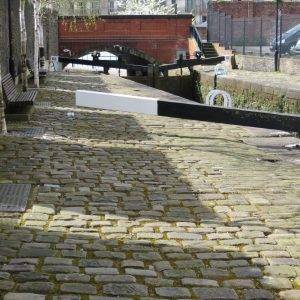 Cross the Vintage Quay bridge over the Rochdale Canal and you will see Lock 84 and the arch where the walk begun. Hey! 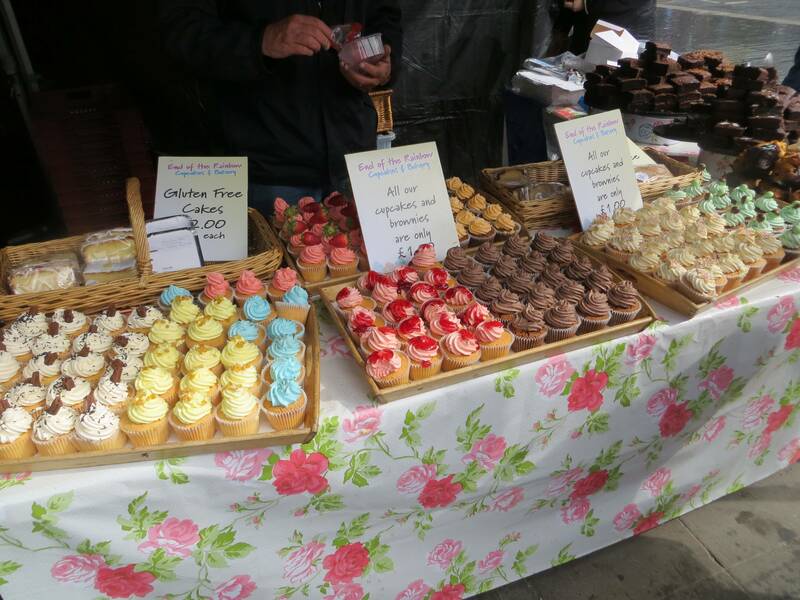 Little Cupcake 2 Hardman Street, Hardman St, M3 3HF (0161 832 0260 www.heylittlecupcake.co.uk) in Spinningfields does the most delicious, quirky cupcakes. North Tea Power, 36 Tib St, M4 1LA (0161 833 3073, www.northteapower.co.uk) is a very friendly coffee shop where freelancers are often found huddled over their laptops. Takk, 6 Tariff St, M1 2FF (07989 583576, www.takkmcr.com) Hipster hangout with minimalist, arty decor serving artisan coffee and Mediterranean sandwiches. 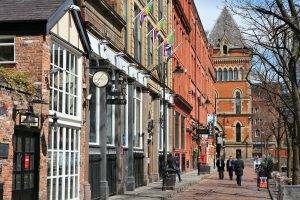 The Northern Quarter is one of the best spots in the UK for independent, quirky shopping. Just drift around and you will find lots of interest, or visit www.creativetourist.com/manchester/northern-quarter beforehand for inspiration. One of the best-known places is Affleck’s Palace, a former department store which has been turned into a multi-storey bazaar for alternative clothing and nick-nacks. Museum of Science & Industry, Liverpool Rd, M3 4FP (0161 832 2244, www.msimanchester.org.uk) If you have a bone in your body interested in technology or our industrial history, then this is a ‘must visit’. Great family venue too. Manchester Art Gallery, Mosley St, M2 3JL (0161 235 8888 www.manchesterartgallery.org) has a good collection of Victorian art, especially the Pre-Raphaelites, and Victorian decorative arts.